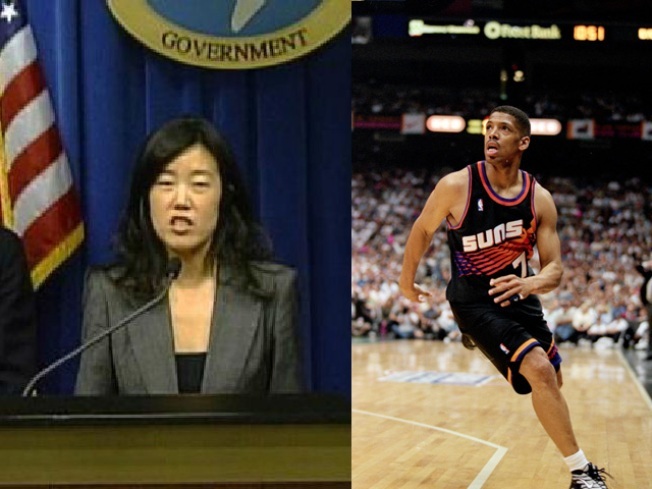 District Schools Chancellor Michelle Rheehas been coy about her relationship with former NBA star (and current Sacramento Mayor) Kevin Johnson. Despite reports of the two holding hands in public, Rhee has always opted out of talking about her personal life. But the divorced mother of two couldn't hide a shiny ring on her finger from the Washington Post's Reliable Source Wednesday night, and eventually confirmed that she was engaged to KJ. Those who oppose Rhee's tough tactics in D.C.'s public schools shouldn't cheer too loud, however. Rhee told the Post she's not joining her new love out in California anytime soon. "... Rhee told us she's not leaving D.C. They plan on a long engagement -- no wedding date set, and none envisioned in the near term -- and will keep this a commuter relationship for a while." So the revamping of the District's schools will continue under Rhee's watchful eye (and large broom). Congrats to all, and here's hoping the marriage starts off better than her rocky relationship with D.C.'s Council, the students' parents and the teachers' union.